Living a short walk from Snow’s Shipyard in Rockland, where his father and older brother worked, Elmer knew the critical and most visually appealing moments in large shipbuilding. He also traveled to nearby yards. Here he captures the classic scene of a vessel’s finished frame at the Wilbur Morse Yard in Thomaston. Since he worked and went to school, Elmer took his photographs on Sundays when the yards had been cleaned up and workers had a day off. By the late 1930s, the sight of a large vessel in frame, altogether common for centuries, had become a rarity. For decades when photographers roamed waterfronts, this was the classic image to capture; only a launching was more frequently photographed. 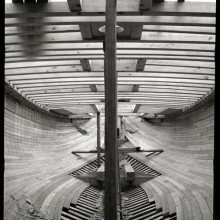 With his shipbuilding knowledge, Elmer knew when the construction of a wood vessel would reach such a critical juncture: he’d seen enough so that he could take a carefully composed photo when a ship’s structure was at its most sculptural. It appears that the photographer chose an overcast day, which helped diffuse the low October sun and provide even lighting for what is essentially an indoor shot. Elmer Montgomery grew up in what was formerly known as South Thomaston, Maine, and frequented nearby Rockland. In his 20s, before World War II, he poured himself into building ship models and photographing local waterfront scenes. His patience and natural talent show in both. His models and photographs were of professional quality, showing a fine eye for composition and a keen sensitivity to subject matter. His father and older brother worked at Snow’s Shipyard in Rockland; shipbuilding would have been the focus of family conversations and naturally became a favorite photographic subject for Montgomery, to which he brought an insight rare among photographers. He captured other disappearing waterfronts scenes with his folding Kodak as well. Penobscot Marine Museum’s archive of his work is comprised of some 730 photographs, made over roughly a decade beginning in 1936. After the serving in the U.S. Army during World War II, Elmer married, moved into Rockland, and started work in a local bank from which he retired as president. He gave up serious photography, but maintained a real interest in things nautical, worked at building ship models and the occasional small boat, and finished the construction of his house.